Location: Western tip of Coney Island. Description: 75-foot white skeletal tower, central steel column with 87 steps, black gallery and lantern. Original optic was Fourth Order lens flashing red every ten seconds. 1890: Two range lights built to help ships around Norton's Point. First lit August 1. 1891: Fog bell established at station. 1896: Front range light discontinued. 1915: 600-foot seawall built to help prevent erosion. 1918, April 11: Storm claims fog bell. 1919: Fog bell replaced and riprap added to help protect it. 1960: Frank Schubert is assigned to station. Frank had begun his lighthouse career in 1938 aboard the tender Tulip. 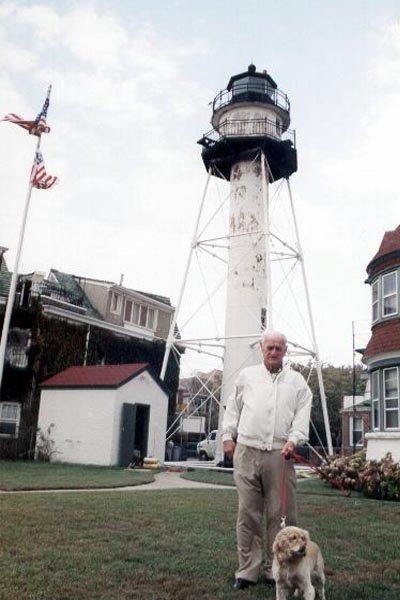 December 2003: Frank Schubert, America's last civilian lightkeeper, passes away. Public access? No. Located in a private community in Brooklyn called Seagate, between B47 and B48 streets. Similar Lights: None locally extant, but the tower was built as an exact duplicate of the Throgg's Neck tower. The dwelling was built as an exact duplicate of the Gould Island, Rhode Island dwelling. Other information: Harbour Lights created a replica of this light in 2001.
and Blazer. Frank passed away in December 2003.